Off from the main routes, the roads are quiet and you can explore this area which is known locally as Joyce Country, or Dhúiche Sheoigheach in Irish. One such route would be to follow the Joyce Country Drive past the Post Office in Corr na Móna village, past the townland of America, through Clochbreac to Finny. 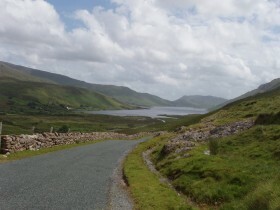 Continue on the road that runs along the shore of Lough Nafooey and after a bit of a climb, drop down towards The Larches Pub, where you can get a cup of tea/coffee or something stronger. Before you take the steep climb out of the valley, call to see Joe Hogan, renowned basket maker or watch a demonstration of working sheep dogs (More details on request). 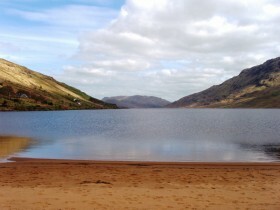 The “beach” at the end of Lough Nafooey is a suitable rest stop and then on through the tiny village of Shanafaraghaun to the start of the hill that takes you out of the valley. As you wend your way uphill, stop, and look back at the wonderful view behind you. The road continues through wild moorland scenery and then drops down in to the Maam Valley. Turn left at Maam Valley Pottery and head back towards Maam (An Mám). Refreshments can be found at Keane’s pub at Maam Bridge. The last leg of the journey brings you on from Maam village up the hill where you can get a sight of Castle Kirke below you. At the top of the hill, you will see a different aspect of Corrib and the Dubhros peninsula as you look north-east. 18 hole courses at Ballinrobe, Oughterard, Ballyconneely, Westport. Ashford Outdoors, located in Cong, also offer a range of activities including kayaking, biking, standup paddle boarding (SPB), tree climbing & zip wire. Horse riding is also on offer (see below). 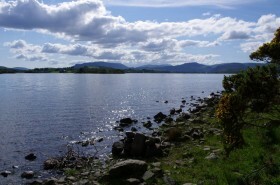 Corrib Cruises, www.corribcruises.com, based in Cong, offer a choice of cruises on Lough Corrib including the Island Cruise which is a 2 hour cruise, including 40 minutes on Inchagoill Island, the largest island on Lough Corrib and the location of several historical remains (June-October and August). Cost of fares: Adult €25;Children €10 -Under 5yrs free. Depart Lisloughrey Pier 3pm or at Ashford Castle pier – boarding 2.30pm, departure 2.45pm. One hour History Cruise: €10-€20. Oughterard – Inchagoill – Cong – Return trip: €14-€28. Connemara is an area of wild and rugged landscape, wonderful views of mountains, lakes and beaches with places of interest to visit such as the Connemara National Park, Kylemore Abbey and Garden and Dan O’Hara’s Heritage Centre. It is also an area noted for the richness of its flora with some species unique to the region. Follow the link for further information. 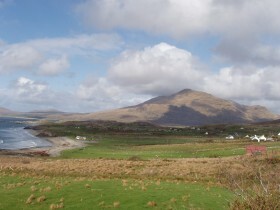 View our Photo Gallery of Connemara. Horse riding is available in Cong, at the Ashford Outdoors centre. On offer are a variety of equestrian activities including lessons and trail rides, and for the more experienced rider, hacks. Also on offer: Zip Line, Kayaking, Biking, Archery. Contact: info@ashfordoutdoors.com or telephone +353 9495 46507.